HHE research group in the news. Follow the link to reach an article published in the CHEPA newsletter reporting about the Humanitarian Health Ethics research group’s events in Geneva, that took place in September 2018. What is the role of ethics in humanitarian health research? See HumEthNet members Dónal O’Mathúna, Lisa Schwartz and Matthew Hunt discuss the important role ethics plays throughout the research cycle and within public health research during a humanitarian crisis. About the R2HC research ethics tool. From a new resource on Community of Practice for Integrated People Centred Palliative Care by WHO, info@integratedcare4people.org. HumEthNet members, Donál O’Mathuna and Lisa Schwartz were major contributors to the statement. It is significant and worth sharing that HumEthNet members were asked to make ethics a core feature of the statement from WADEM. Thank you to the European Association for Palliative Care for including our research, including the invitation for participation in our research survey, as part of their new series about palliative care in the context of humanitarian crisis. Access the blog post here. Public Health Ethics (2017) 10 (1): 49-61. Humanitarian actors are now pressed to respond to increasingly complex crises in diverse and difficult contexts. Historically subject to multiple and often divergent interpretations, humanitarian values are now further challenged by changing conflict dynamics, globalization and its effect on shifting power relations, and a more sustained criticism of established forms of humanitarian response. Though under appreciated, ethical reflection offers an opportunity for deeper evaluation of humanitarian action, and its impact on those who endeavour to alleviate suffering and protect human dignity during, and in the aftermath of, humanitarian crises. This edited volume seeks to bring together academics and practitioners engaged in all aspects of both direct humanitarian response and scholarly humanitarian reflection, with the aim of offering a nuanced insight into the complexity of the humanitarian experience in a diversity of crisis contexts. As such, we welcome contributions related to any aspect of humanitarian action and ethics, with a particular interest in practitioner perspectives. 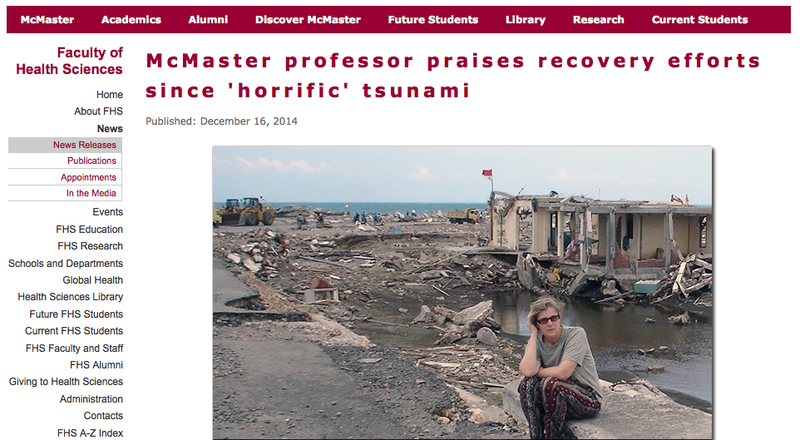 HumEthNet team member, Lynda Redwood-Campbell, is featured in a recent article that revisits her experiences in the humanitarian efforts that followed the 2004 tsunami.